Absolutely the best location in Palm Springs (closest single family home in relation to downtown Palm Springs). Eat at one of Palm Spring's most famous restaurants; Viceroy, Melvyn's, Spencer's, Wangs. Go shopping, see a movie, spoil yourself at a day spa, take in the art museum, visit a gallery, try your luck at the casino, go on a hike or refuel yourself at one of the many local coffee houses. ALL WITHIN WALKING DISTANCE! If you still have the energy once the evening comes, go around the corner to one of the may bars, nightclubs or restaurants. Arenas Road is only a half a block away. No car needed! Flat screen TV's and DVD players in every bedroom. Big screen in living room. Private salt water pool and spa. Each bedroom has it's own private entrance. Hammocks for reading, relaxing, or taking a nap. Minutes to Downtown Palm Springs & the trendy "Uptown Design District". Spectacular views of the San Jacinto Mountains. View the historic Albert Frey home from the backyard. Located inside the home off the kitchen for your convenience. Palm Springs requires no more than 3 cars to be parked at this home at any given time of day. High speed Wifi for all your business or streaming needs. Flat screen TV's in the living room & every bedroom. Cable TV in every room as well as Roku streaming sticks. Stream your favorite shows on your shows with your accounts such as Netflix or Hulu. Big Bear Lake is just 90 miles away. Outdoor Dining for 6, lounge chairs & umbrellas in the oversized backyard. Big Bear Lake is just 90 miles away. Cross country skiing is available at the top of the tram (weather permitting). Close to Ruth Hardy Park. Play structures, 8 public tennis courts, 3 sand volleyball courts, picnic tables, basketball court & tot lot. The Palm Springs Vacation Rental Ordinance requires the following: All persons must be at least 25 years of age or accompanied by parent or legal guardian. The maximum number of guests shall not exceed posted limits. Outdoor music of any kind or excessive noise is not permitted at any time. No more than 1 car per bedroom is allowed per home. 3 car maximum. Failure to do so can result in fines being issued directly to the occupant of the home. Please refer to your rental agreement or ask for greater detail. This is a charming Casita in the midst of larger Condos and lodgings. It is very well equipped with everything you need from spices in the kitchen , lots of bath towels, linens, and beach towels. The house accommodates 6 people comfortably. 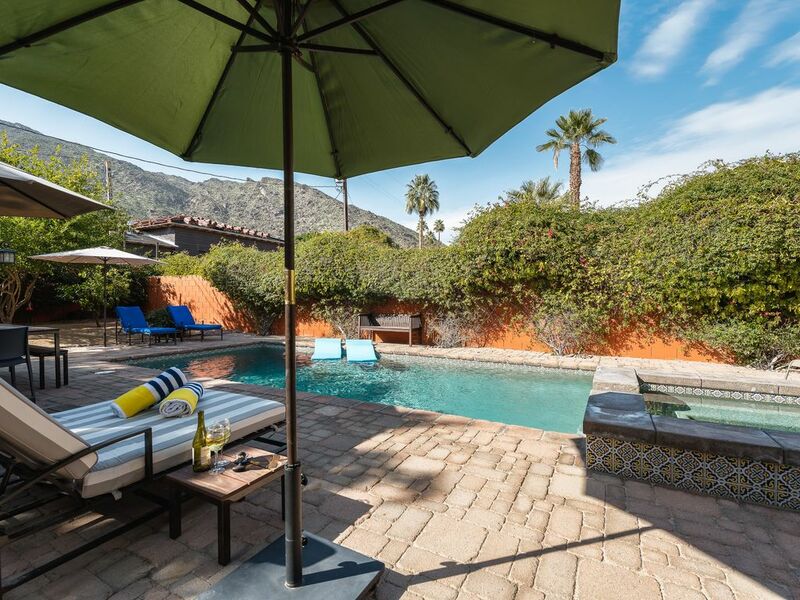 The biggest draw for the Casita is the beautiful backyard and pool area with several lounge chairs, umbrellas, eating area and landscaping. Though in the midst of larger condos it feels very private. It also is within a short walking distance to downtown and museums plus VERY convienent to the airport. I would definitely stay here again and recommend to others. The "Casita" was beautiful! The property is well kept & clean. My family & I fell in love with the house the moment we set foot inside. We spent the entire weekend swimming & relaxing by the pool. The house is walking distance to all the best restaurants & shops. We've decided that we're definitely returning to the "Casita"! 6 of us stayed at La Casta. A mom and dad in our 50s, two boys and 2 girls (all 21/22 years old.) We absolutely loved it. Parked our cars and didn’t use them again til we left since every place you’d want to go is walking distance. The backyard is huge. We made use of both hammocks, the pool, the hot tub, and the lounge chairs. What’s really perfect is that each bedroom has independent access to and from the backyard. We “oldsters” relaxed at home in the evening, while the youngsters went out and hit the town. We will definitely be coming back to this house. Beautiful and cozy little house!! La Casita is the best! Great house to relax indoors and out. Backyard is private with pool and spa. The area is nice and quiet. It is within walking distance to downtown Palm Springs. Hopefully we will be returning. Thank you to everyone who answered all my questions and responded so quickly. Just returned from this gem! Location can not be beat! We walked everywhere - restaurants, shopping, museums, hiking trails. Close to it all but we still felt we were in a quiet oasis when in the backyard - beautifully landscaped with plenty of lounging. Pool was perfect. Destinations within 1-2 hour drive: Big Bear, Lake Arrowhead, Idyllwild, Joshua Tree, Salton Sea. Security deposit is 750.00 (refundable) There is a $50+tax a day optional pool heating fee available (when needed) Minimum stays may vary over holidays & events Normal check in is 4 pm, normal check out is 10am The Palm Springs Vacation Rental Ordinance requires the following: All persons must be at least 25 years of age or accompanied by parent or legal guardian. The maximum number of guests shall not exceed posted limits. Outdoor music of any kind or excessive noise is not permitted at any time. No more than 1 car per bedroom is allowed per home. 3 car maximum. Failure to do so can result in fines being issued directly to the occupant of the home. Please refer to your rental agreement or ask for greater detail.